Regulatory Division eration Iraqi Freedom, where he served as the senior U.S.
E and experience in the effort to properly maintain, upgrade ington, D.C. He also provides leadership and oversight for and improve our inland waterways. Listen in this month as activities and programs within the Corps’ Lakes and Rivers and North Atlantic Regional Integration Teams. 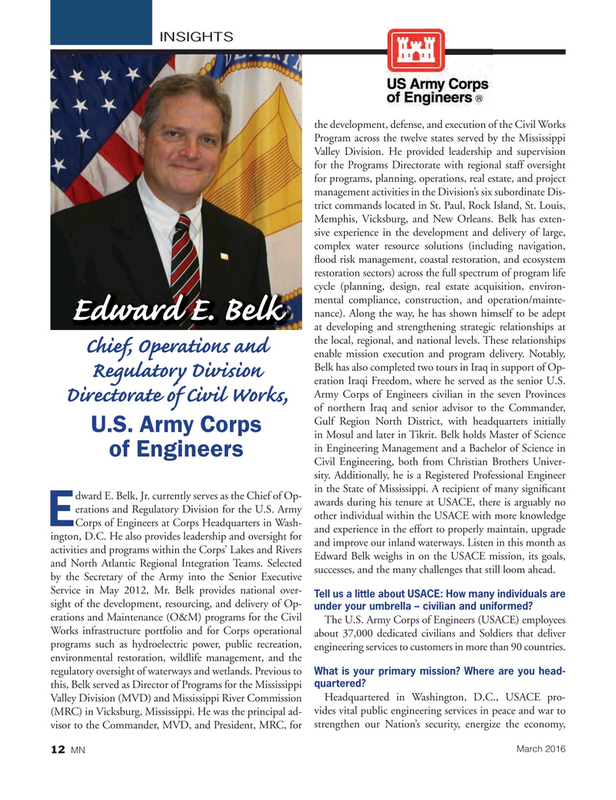 Selected Edward Belk weighs in on the USACE mission, its goals, by the Secretary of the Army into the Senior Executive successes, and the many challenges that still loom ahead. Tell us a little about USACE: How many individuals are sight of the development, resourcing, and delivery of Op- under your umbrella – civilian and uniformed? Works infrastructure portfolio and for Corps operational about 37,000 dedicated civilians and Soldiers that deliver programs such as hydroelectric power, public recreation, engineering services to customers in more than 90 countries. What is your primary mission? Where are you head- quartered?